Are you interested in living a safe, comfortable life that looks like the American Dream? If so, don’t read this book. 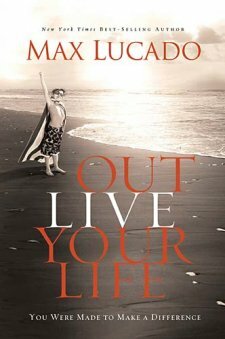 It’s been a little while since I read a Max Lucado book, but I think Outlive Your Life might go down as one of his greatest works, if not his best. From the very first chapter to the end of the book he consistently looks at stories of the early church in the Book of Acts and how that group of Christians lived lives that were bigger than themselves. They changed the world around them. For example, in the opening chapter he writes, “God has given this generation, our generation, everything we need to alter the course of human suffering.” That’s a compelling challenge, one that the church MUST respond to. We must be faithful with the resources God has allowed us to have. But he doesn’t just leave it at that. We want the world to change, to be made better for everyone. But we don’t want it just for the sake of making the world a better place. Max writes about this in the final chapter: “But for the Christian, none is higher than this: when we love those in need, we are loving Jesus. It is a mystery beyond science, a truth beyond statistics. But it is a message that Jesus made crystal clear: when we love them, we love him.” As Christians, we MUST love those in need. It’s like my preacher, Art McNeese, says. The church is called to reach the lost, the last, and the least. Brea and I have recently decided to do more to help people in need. We’re sponsoring a child through World Vision. We’re campaigning to raise money for charity: water by giving up our birthdays. And we’ll be looking for opportunities to reach people who live in Denton County and the D/FW area with the love of Jesus. How are you reaching people with the love of Christ? I’d love to read your story. Please share in the comments. Great review! I am going to add this book to my list! Thanks for the review, Kevin. I got to hear the sermons that led to this book but haven’t had a chance to read the actual book yet. We have sponsored one child through World Vision for some time but just added another one. We have lots of opportunities through our church to get involved in the community and the city and help where we can. A lot is happening at our church, it is exciting to be a part of it.